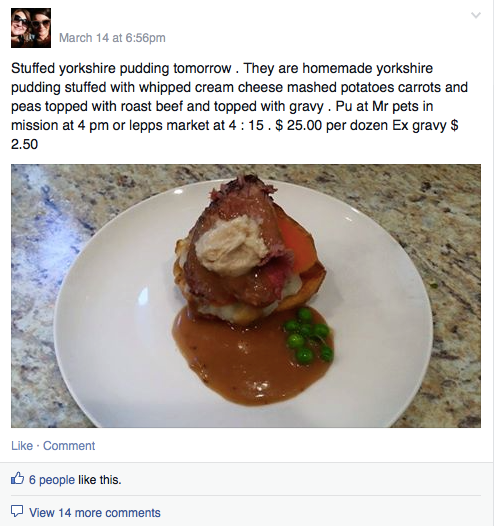 Can you actually sell on Facebook? How does it work? What are your options? 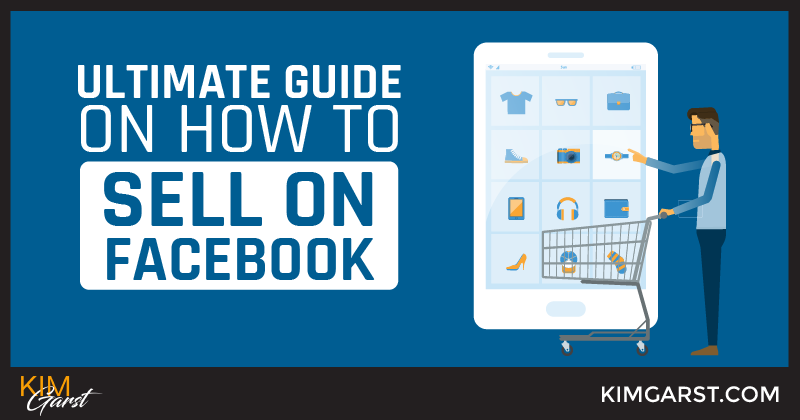 My ultimate guide on how to sell on Facebook will walk you through how to sell on Facebook! If you have not tried selling your products and services via local Facebook groups, you are missing out on a huge opportunity to sell to people in your community. These groups function much like an Etsy shop or EBay – some are set up for direct selling, while others require users to bid over a set period of time (usually 24 hours). There are local groups for everything you can imagine, especially in bigger metropolitan areas: household items, kid’s clothes, baked goods, cars…even real estate! Try searching Facebook for your city or town name, and see what comes up! I believe the potential to sell on Facebook groups is HUGE! Facebook is even testing out official ways to “Sell Something” in groups. Read about it here. A great way to get started with selling on Facebook is to set up an e-commerce store using a service like Shopify. After setting up an account, a link to your shop will appears under ‘Apps’ on your Facebook Page. A Shopify store is easy to set up, and for only $9/month you can add unlimited products to your store. You can even sign up for a free 14-day trial to see if it is right for you. Some other apps you may want to check out include Ecwid (free), ShopTab (around $10/month) and Beetailer (free option, up to $80/mth for larger stores). Obvious, right? While the majority of your Facebook posts should be offering content that is useful or entertaining to your fans, there is a place for directly promoting your products or services. When you ensure that at least 80% of your posts are non-promotional, you can feel good about the 20% of the time you do promote your wares! Facebook has recently cracked down on promotional posts. Back in December they announced that they would be limiting posts that solely pushed people to buy a product or app. In order to make sure your post gets seen, ensure you provide valuable context within your post. Provide a great backstory to your product, and avoid being too ‘salesy’. Always include a great, eye-catching image with your post. 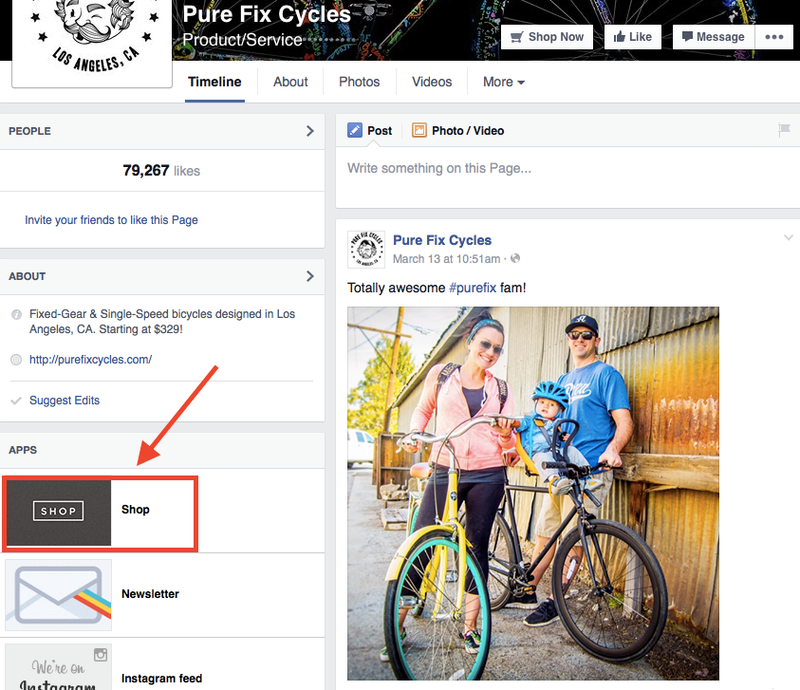 If you do not like the image Facebook automatically includes with your link, you can always change the thumbnail by clicking on the arrow in the top left corner of the picture, OR click ‘+ Upload image’ to add our own! Facebook offers a variety of advertising options to drive traffic to your online store or local business. 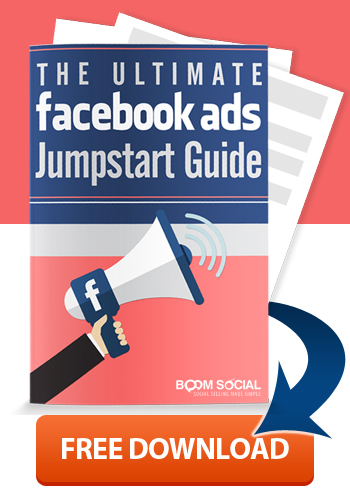 Facebook allows you to set up specific targeting to make sure your ads reach the right people. You can target via location, gender, relationship status, age, interests and more. 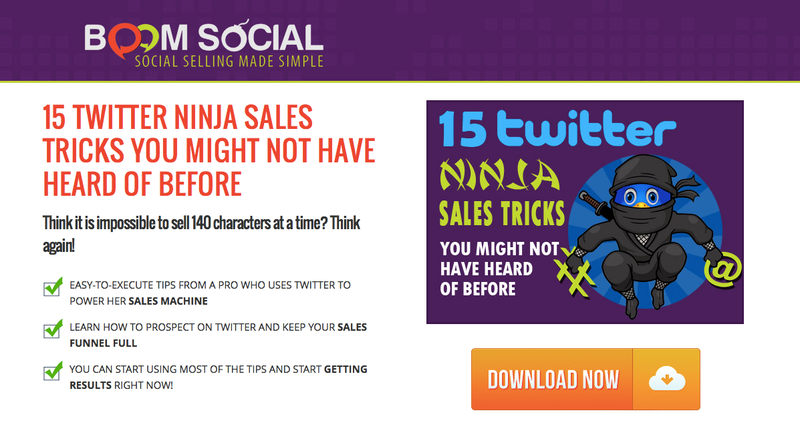 To ensure your promotional posts actually get seen by your fans, try using paid promoted posts. For just a few dollars, you can extend the reach of your posts significantly, making sure your posts get seen in users’ newsfeeds (rather than in the sidebar, as is the case with ads). This is by far one of my favorite ways to use Facebook for driving sales. Selling directly on Facebook is great, but tends to drive more one-off sales. I would rather entice my Facebook fans to sign up for my email list, and then have the opportunity to build and nurture long-term relationships! To do this, first make sure you are signed up with a great email management service (I recommend aWeber). Create a dedicated landing page on your site that will entice people to join your list (offering a free product is one of the best ways to do this). Then periodically promote this free product via an organic Facebook post, promoted post or offer! I have left this one until last, because no matter which of the strategies above you use, you must ALSO do this one! This is the how to sell on Facebook free model. This one is a bit more work but oh so worth it! The key to successful selling on Facebook is building trust with your fans. And the way you do this is by providing valuable and useful information to your fans. Regularly write blog posts that address the needs, interests and pain points of your audience, and then promote these posts on Facebook. Engage in discussions, answer questions and encourage and inspire your fans. As they recognize that you know your stuff and that you are trustworthy and authentic, your sales are bound to grow! Selling on Facebook IS possible! I hope this ultimate guide to how to sell on Facebook has proven this. I would love to hear your stories of selling on Facebook: How do you promote or sell your products or services on Facebook? Share below! These are great selling ideas, Kim! I’ve been using the Sign Up button on our Facebook page ever since we got it and we see a continuous stream of new subscribers every week, which is fantastic! I never knew about the Sell option available in FB groups, and I see that the linked article is from December 2014. Do you know if that feature ever took off? Thanks for your great tips, as always! I had a website and it was hacked into and destroyed, so I am seriously considering these steps you’ve given to setting shop up on Facebook. Kim, you are an inspiration to me as I love your business style and especially appreciate the fact that you have a deep love for God. That, to me, is very important to always put God first in any situation and you definitely do that. I wish you well in all your business endeavors! Awesome! I just published my first book (little dance!) and was trying to come up with some ideas to promote it on Facebook besides profile updates. I also like that Sign Up button idea for my newsletter, that is a great tip! Some great ideas as usual. Facebook groups are specially popular for selling in Egypt. Great ideas to use for Facebook. 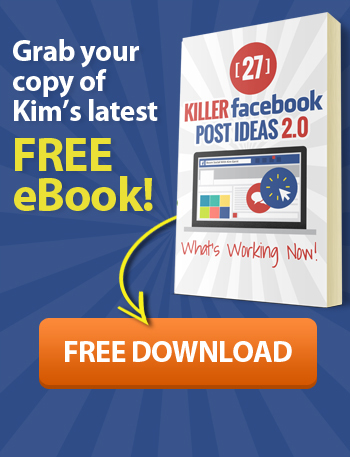 I’ve used 3 of these ideas and that using Facebook Ads, Funneling my visitors to my email list, and sharing valuable posts. I had the most success with the Ads, but there was always room for improvement. I was getting 2 to 3 leads a day and just a couple of sales a month. That’s where there needed to be improvement! Thanks for sharing Kim! Have a great Easter weekend! This was a masterpiece I must say that!!!!! Interacting with your prospects and always have a better response to them related to their quires and problems with the visual images can appeal them more. personally i prefer the facebook ads option, its a more preferable way i get to reach more readers and more legit likes on my page with just few box. Thank you Kim for all your materials and a great advice! I find your articles and posts, very helpful! Blessings! Thanks for dropping in and taking the time to leave a great comment!